Wow. That’s what I have to say about these brownies. They are essentially fudge, and the hint of salt gives them a dangerously addictive flavor (salt + fat = humankind’s downfall). If you’re anything like me, you’ll want to take me up on this piece of advice: bake these ONLY if you have a plan for getting rid of the majority of them very soon after baking. They are dangerous if left lying around the kitchen. Recognizing this, I quickly packaged the bulk of them and shipped them off to my dear small brother at college. I sent them via priority mail (because that’s how great of a sister I am), hoping they would arrive in a timely manner and retain their moist deliciousness. They did. Well done, United States Post Office. The moral to this baking story: Any day I can make stressed-out college kids halfway across the country a little happier is a good day. Preheat oven to 350°F. Line a rimmed 9×13-inch baking sheet (or dish) with parchment paper. In a metal bowl resting over a pan of simmering water on the stove, melt together the butter and chopped chocolate, stirring until smooth. Meanwhile, combine the flour and kosher salt in a medium bowl. Transfer the chocolate mixture to a large mixing bowl and whisk in the cocoa powder and sugar. Add the eggs and vanilla and whisk until smooth. Fold in the dry ingredients and continue folding until no lumps remain. Scrape the batter into the prepared pan and smooth the top with a spatula. Sprinkle all over with the flaked sea salt. Bake for 25-30 minutes (depending on the size of your baking dish, you may need to bake a little longer), until the edges just begin to pull away from the sides of the pan and the top is set and shiny. 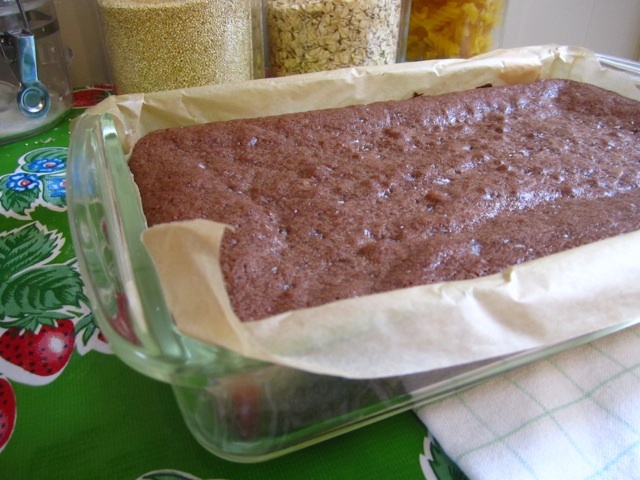 Allow the brownies to cool completely in the pan before cutting into 2×2-inch squares. If desired, sprinkle with sea salt before serving. 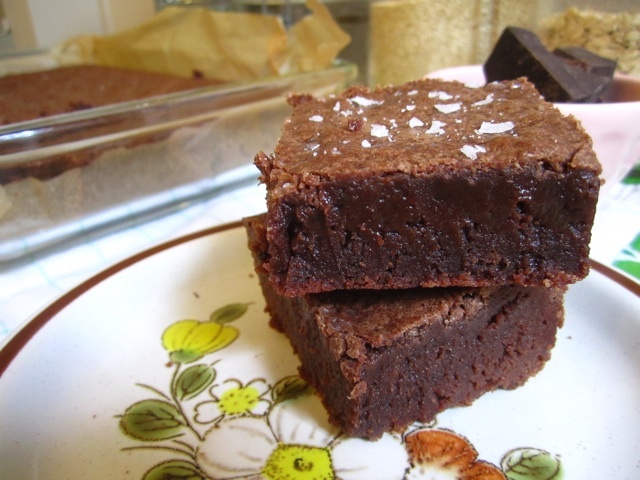 This entry was posted in Not pie and tagged brownie, fudge, salt. Bookmark the permalink.